KPSC FDA SDA Previous years question paper download PDF fully solved MCQ Questions Answers Karnataka First & Second Division Assistant have been given below. Karnataka Public Service Commission frequently conducts competitive recruitment examination for the posts of FDA and SDA. Written test is conducted for the purpose of recruitment of Karnataka PSC posts. Graduate candidates can apply for the First Division Assistant posts in Karnataka Public Service Commission. Question paper with answer key for previous last years old question paper may be found on the official website of Karnataka PSC which is www.kpsc.kar.nic.in. For second division assistant candidates should have done Diploma. There are 3 papers asked in the written test of both FDA & SDA which are Kannada Language, General Knowledge and General English. Multiple choice objective questions are asked in all the paper mentioned above. 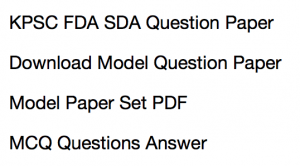 Previous years question papers for the FDA and SDA exam (all three papers) have been given below. The given old question paper link has been given below in PDF format. Candidates who are preparing for the mentioned exam may found the question paper very useful. Answer key for the written test paper set wise may also be found on the official website if the authority / recruited uploads the same. Download the question paper part wise and use this as a practice set for the upcoming exam. KPSC SDA Model Question Paper & FDA Sample paper for the General English & General Knowledge paper upcoming question recruitment exam 2017 may be found below. The model questions answers may be used as practice set paper. Thinking about how to download the old question papers in PDF format ? Well the process answers your queries. Click on the relevant link which will take you to the page of SDA or FDA previous years question paper download. Now you need to right click on the PDF paper and then select save as option. You will be able to get the old question paper. You may also find the answer key or solution of the question paper which may be downloaded in Kannada or English language. Practicing the model questions answers for the First Division Assistant and Second Division Assistant in Karnataka Public Service Commission Examination is highly recommended along with the study of Previous Years Question Paper which we have provided here. These study materials may also be helpful if you are preparing for any other competitive examination.